If you don't mind paying a premium for something premium, then the MW50 Wireless are for you. The attention to detail is impeccable. However, if you pride yourself on picking out the best bang for your buck, there are more economical alternatives out there. Master & Dynamic is a New York City-based premium audio company founded by CEO Johnathan Levine and Vicki Gross in 2013. The company collaborates with recognized designers and aides musicians via its “In-residence” program, allowing artists to use in-house recording studios. If Master & Dynamic interests you, check out Adam’s interview with Levine at CES 2018. Otherwise, stick with me to see if the Master & Dynamic MW50 Wireless are worth the opulent asking price. 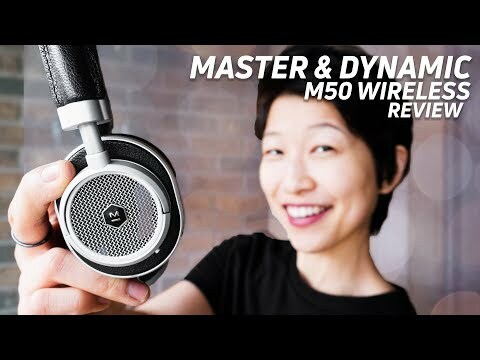 Who are the Master & Dynamic MW50 Wireless for? These are for the listener who prioritize aesthetics before sound quality. After all, the company’s homepage quotes Esquire saying, “So what would you rather do? Blend in or stand out?” The MW50 Wireless are a pair of headphones that compel strangers to inquire about them. That’s not to say that the Master & Dynamic MW50 Wireless fall short on sound quality—quite the contrary. The MW50 Wireless On-Ear headphones will please aesthetes and general consumers alike. Now, these aren’t strictly about aesthetics with the Master & Dynamic MW50 Wireless. No, not at all. Each part of the MW50 are replaceable, and this philosophy bleeds into all Master & Dynamic products. If you’re looking to invest in a product, the MW50 Wireless are an eye-catching contender. If you’re a proponent of sophisticated looks with clean, deliberate lines but don’t want to lose half a month’s rent to a pair of headphones, then you’ll like the Bowers & Wilkins P5 Series 2. These headphones currently retail for less than half the price of the MW50 Wireless and reproduce a similar, arguably better sound­—depending on your preference—than the headphones in question. For all the company’s prominence that it places on quality and durability, I’m surprised that a canvas carrying pouch was included rather than something of the hard-shell variety. In all fairness, it’s still nice nice and features two magnetized tabs enveloped in a leather membrane that keeps things shut. Inside said pouch is another pouch, holding the 1.25-meter long 3.5mm cable and USB-C charging cable—pouch-ception, you could say. The included USB-C and 1.25-meter 3.5mm auxiliary cables can be stored in the leather cable case. Of course, you also get the Master & Dynamic MW50 Wireless in your chosen palette (silver and black, silver and brown, black and olive, or black and black) and a cylindrical leather cable box branded with the Master & Dynamic logo. This is hands-down the finest cable holder that I’ve ever seen; the stitching is impeccably done. First thing’s first, these headphones are gorgeous. From the detachable lambskin memory foam ear pads to the premium grain cowhide leather headband, it’s hard to classify the Master & Dynamic MW50 as just headphones when they double as a work of art. And we haven’t even gotten to the stainless-steel accents and all-aluminum antenna, which supposedly propagates improved Bluetooth range—more on that in the connectivity section. Anodized aluminum accents the headphones, and their hinges rotate vertically and horizontally, allowing for superior comfort. Prior to using these, the Bose SoundLink On-Ear Wireless were the most comfortable on-ear headphones that I had used, no contest. Now, though… now, I have to think about it. Though the Bose headphones are a dash more comfortable due to their plastic housing, Master & Dynamic gives the powerhouse company a run for its money with the MW50 Wireless. Plus, you can fold the MW50 flat for storage, while the SoundLink On-Ear Wireless fold up instead. These headphones are in good company with us glasses-wearers. My thick-rimmed, plastic frames held up for an hour and a half before I had to take a break. The memory foam ear pads are a dream to wear and—to my surprise—feel more supple than the Bowers & Wilkins P5 removable ear pads. With sliding aluminum rails buttressing the housing, even the act of extending the headphones to fit your head looks elegant. There’s a lot of pride going into the Master & Dynamic MW50 Wireless, which is illustrated by the branding found… everywhere. But Master & Dynamic should be proud; these illustrate true craftsmanship at work. Tactile controls are great, but our review unit has a hard time registering commands unless a button is depressed in an obscenely specific manner. Funny that you ask. I found the playback and volume controls an absolute pain to use. Perhaps our review unit is faulty in this regard, but I have to press the buttons in a very particular way—by using the edge of my nail—for a command to be registered. The dual mic setup is great; the microphones perform almost as well as the Bose SoundLink On-Ear Wireless but don’t do quite as good of a job at lessening ambient noise. In windy conditions, they both perform equally well, so you’re best bet is to take calls from the MW50 Wireless indoors. How’s the battery life compared to other on-ear wireless headphones? The Master & Dynamic MW50 Wireless provide 16 hours of playback time on a single charge and easily reach that with the volume at 50 percent. For those keeping score at home: 16 hours of battery life found here is an hour less than the Bowers & Wilkins P5, but it’s more than a full workday either way. The MW50 Wireless headphones hold enough charge to last for 16 hours of playback time. How about that USB-C charging? USB-C charging is great, especially since most of my devices are now USB-C compatible, it’s implementation is becoming ever more convenient. At this price, it would’ve been nice to see a compatible power brick included in the package. On the other hand, an old phone charger should do the trick. And it falls short of the claimed Bluetooth range. Okay, so maybe if I stood in an open office space and walked 30 meters from my phone, things would be okay. Unfortunately, the reality is that many of us live and work in large boxes sectioned off into countless smaller boxes that we flounce to and from. While testing the MW50 Wireless, I found that they struggle to maintain a solid connection when three—sometimes just two—walls separating the headphones from the source at the 15-meter mark. The left and right sides are labeled with an L and R, respectively. The L is in blue and R is in red. Don’t get me wrong, the connection is still impressive and better than the average 10-meter Bluetooth range. It just falls short of the claimed 30 meters. It’s strange that these are Bluetooth 4.1, (not Bluetooth 4.2) but most of us would be hard-pressed to tell a difference during regular use. If you want the guarantee of uninterrupted listening, keep your phone close to these headphones… or surrender altogether and use the included 3.5mm cable. If you have an AAC-compatible device, then you won’t experience any lag. For instance, my LG G6 and Microsoft Surface Book (2015) are both able to play Game of Thrones without any lag. Additionally, the MW50 are able to connect to two devices simultaneously; switching is a seamless transition. Do the 40mm beryllium drivers mean anything or is it just a nice-sounding marketing ploy? The MW50 feature removable earpads that reveal a slight peak at teh 40mm beryllium drivers. Well, hello, my fellow skeptic. It’s a pleasure to make your acquaintance! I’m pleased to report that the beryllium drivers do what Master & Dynamic claims: They form a light, yet stiff diaphragm. This setup accurately reproduces sound without falling prey to diaphragm-caused distortion that more flexible materials create. Actually, materials cost is a large part of why the headphones are so darn expensive. Beryllium is a rare chemical element that benefits structural applications due to its rigidity, thermal stability, and low density. You can find beryllium in aircraft and NASA-related things like satellites. See why it’s so expensive now? Some may say, “robust,” while others posit that they sound, “warm and refined.” We at SoundGuys, well, we don’t claim to be sommeliers, but what can be said about the sound of these cans is that they reproduce an above-average soundstage and have a frequency response that ranges from 5Hz – 30kHz. If you’ve never listened to the Sennheiser HD 598 CS, you’ll be impressed by the MW50’s reproduction of perceived three-dimensional space, especially for a pair of closed-back cans. The MW50’s reproduction of the adroitly mastered song Robot Lovers by Casey Abrams is great (I know I’ve used this before, it’s a good song). The bass guitar sounds deliberately distant, relative to the tambourine that’s perceived to be hit directly next to the right ear. All this is fine and dandy, but if you really want to be blown away by how far closed-back headphone engineering has come, pick up the HD 598 CS. Though the MW50 soundstage is impressive for closed-back, on-ear headphones, the Sennheiser 598 CS blow them out of the water. Granted, the latter are circumaural and are able to take advantage of the ear’s anatomy. I love the Master & Dynamic MW50 bass reproduction; the low end is obviously emphasized but without doing a disservice to the midrange frequencies. Guided by a strategically erratic kick drum, the song Too Late by The Happy Fits features an upbeat, 150BPM tempo that’s well-reproduced by the MW50 Wireless. The kick drum never masks the vocals, unlike when Too Late is played through the absurdly bass-heavy Under Armour Sport Flex Wireless by JBL. Baby Gots Venom, as performed by Toussaint Morrison, is a treat to hear through the MW50 Wireless’ 40mm beryllium drivers. During the verses, Morrison’s spoken vocals are clearly reproduced above the background clapping and snapping track. Now, once he starts singing, his pedestrian speaking voice is transformed into a gospel-reminiscent, soulful plea. The low rumble in Morrison’s humming isn’t lost behind the guitars, which elicit feelings of tension and frustration. Nor is the delicacy lost in the airiness of his final line, “So long to the good fight.” The Master & Dynamic sound engineers did a fabulous job ensuring clarity, and the beryllium drivers help too. The treble is the most neutral-leaning aspect of the Master & Dynamic MW50 Wireless sound signature. In Body Gold by Oh Wonder, the piano chords (Bm and D) are relayed clearly and don’t distract the ear from the duet’s harmonies. This restraint and control of the high frequencies is impressive, seeing as most headphones favor audible treble emphasis to feign clarity. Are the Master & Dynamic MW50 Wireless worth half of your rent? Now that the price has dropped $130, it’s worth reconsidering the MW50 Wireless as a valuable option. Admittedly for the original $450 retail price, these were a hard sell. However, now that the price fluctuates around the $320-mark, it’s easy to see why you may want to pick these up. If you’ve been saving your pennies for something nice and are a die-hard wireless headphone fan, then you should be considering these. They look and sound great. Plus, the replaceable components demonstrate Master & Dynamic’s dedication to product longevity and customer service. The headphones provide a luxurious listening experience, well-worth the money… but only if you have $450 to spare, which many of us don’t. That said, there’s no denying that there are plenty of premium headphones that don’t exceed $300 and offer a similar—if not better—overall experience, especially regarding audio. The hardware is some of the most premium on the market. I commend Master & Dynamic for the attention to detail that went into the MW50. If you have the money to spare, you certainly won’t be disappointed by the MW50 Wireless, there are just more value-packed options available that we could recommend to most consumers. The Bowers and Wilkins P5 Series 2 provide a similarly sophisticated look at less than half the price of the MW50 Wireless. Though the P5 clarity isn’t quite as good as the MW50 Wireless, the bass is slightly less emphasized, which many listeners will enjoy. The Beyerdynamic Aventho Wireless are similar to the MW50 and are aptX and aptX HD-compatible. If you’re determined to hit that $450 budget but aren’t sold on the MW50 Wireless, check out the Beyerdynamic Aventho Wireless. These on-ears will still run your wallet thin while retaining and even improving upon many of the MW50 Wireless’ audio features. For one, the Aventho Wireless support not just aptX but also aptX HD; they’re a bit better at isolating noise; and they have better controls than the MW50 Wireless. Designed for decades of use, these Bluetooth-enabled Master & Dynamic headphones are tuned to provide a rich, detailed, and expansive sound. The exposed all-aluminum antenna provides best-in-class signal range. Exclusive drivers use beryllium for superior acoustics and the cushioned ear cups fold flat for portability and comfort.